DCC Sound brings that extra bit of reality to a model railway, however at a cost of around £100 on top of the normal price of a locomotive, is prohibitive to most. 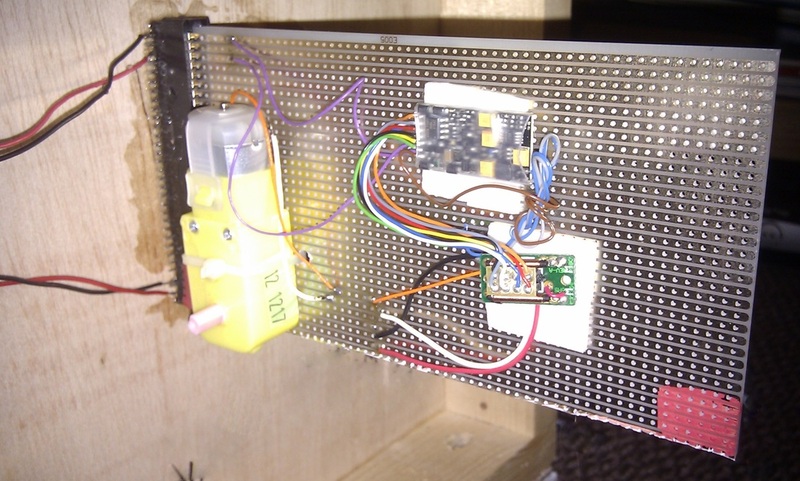 Whilst at the Perth show in June 2013, Bill Auld, being as resourceful as ever, came up with the idea of wiring a sound chip into the track circuit feeding speakers mounted on the baseboards. We talked about this and approached a DCC demonstrator, Paul Chetter, and explained to him what we were looking to do. Paul suggested that he could programme the Zimo Sound Decoders he was demonstrating with a custom sound project and we left him with our heads full of ideas. Paul informed us that we could put a steam, possibly 2, and a diesel loco sound on the one decoder, as long as we didn't want all the storage hungry start-up and shut-down sequences, along with whistles and horns. After an exchange of emails, we agreed on an LMS 2 Cylinder steam, LNER 3 Cylinder steam and a Sulzer Type 2 diesel sound. When we received the decoder shortly after, Paul had managed to fit these sounds on, along with brake squeal, flange squeal, idling, safefy valves etc operated via the Function keys, and as a surprise bonus, he also managed to load on the EE Type 1 (Class 20) sound! Paul suggested that we wire in a motor and gearbox to provide a load to give the sound decoder something to work against. Bill took charge and procured the speakers (2 x 4ohm wired in parallel), motor & gearbox (cheapo from Squires), 8-pin DCC socket (robbed from my spares box), vero board and a PC circuit board socket. 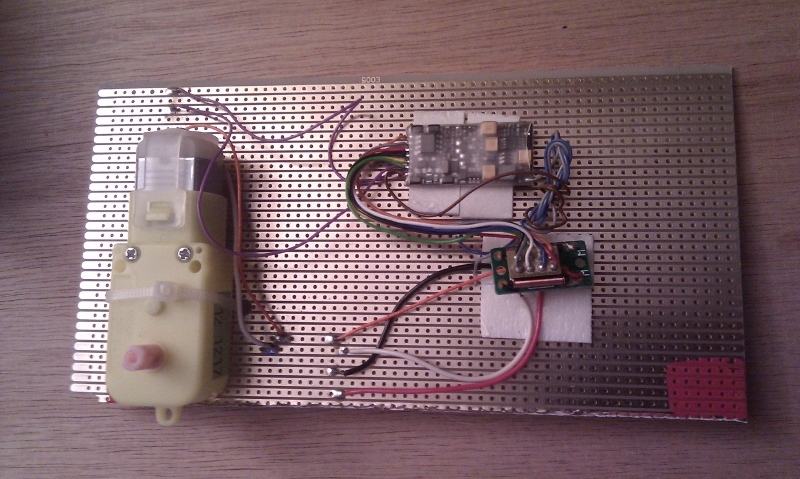 The DCC socket is wired into a piece of vero board, connected to a cheap motor and gearbox to provide a load. The power to the chip comes from the track power bus and the sound signals go to the speakers, one mounted in the pier of a road bridge and one in a good shed. Essentially this gives sound for the majority of our loco's. On the left is the motor and gearbox, top middle is the sound decoder and below that is the 8-Pin DCC socket. The top 2 copper tracks are the audio signal tracks (purple wires on the chip), the lowest 2 copper tracks are the +tive & -tive power in from the track circuit (red & black wires). The orange and grey wires feed the motor & gearbox. To operate the sound chip, a DCC chipped loco is run in a consist with the chip, which responds to the throttle position and acts as if the sound chip is in the loco itself. Some loco's did need the start voltage altered to get the best synchronisation, whilst all my steam loco's need synchronised a little, but this is easy to do just requiring a little bit of trial and error. The Soundcard fits very snugly in the socket, mounted underneath the baseboard. We decided to trial this on Rockvilla Goods as this layout was the next DCC operated (NCE) layout to go out on exhibition. On that layout we positioned the speakers in a bridge pier on the RH board and inside the good shed on the LH board. This gives a good spread of sound and fools the mind into thinking the sound moves with the loco. This one chip was enough to have the correct sound for 6 diesel loco's (1 EE, 5 sulzer) and 1 dubious (Clayton!) on Rockvilla Goods where it received very encouraging feedback and lots of questions. All in all this sound installation cost far less than buying 1 sound fitted loco from a box shifter. The next layout to be fitted with this is Milton Street TMD which is DCC operated (Gaugemaster Prodigy), all we need to purchase for this is 2 speakers and another PC circuit board socket. If you would like to contact Paul Chetter for a custom decoder, please use the contact form on the Home Page and we will direct your query to him. Please note that he is not affiliated with 12AD MRG in anyway, but has been an incredibly helpful supplier.